Move Over Turquoise, the Dominican's Blue Volcanic Larimar is the Jewel of the Caribbean. Esmeralda Lambert has been on a mission since 2013 to meet growing consumer demand for ethically handmade jewelry and accessories, while empowering women artisans in her home country, the Dominican Republic. She has incorporated gems like turquoise and coral into her designs, but they came from other countries and not the rich supply of gorgeous natural materials in the Dominican. So, she went to work over the past few years to build relationships to source native gems, like Larimar (only found in the Dominican), to bring more transparency in supply from handcrafters to end consumers and increase impact to her beloved artisan community. We are happy to announce that this Spring you can take home a piece of the beautiful Caribbean in Esmeralda’s newest line! 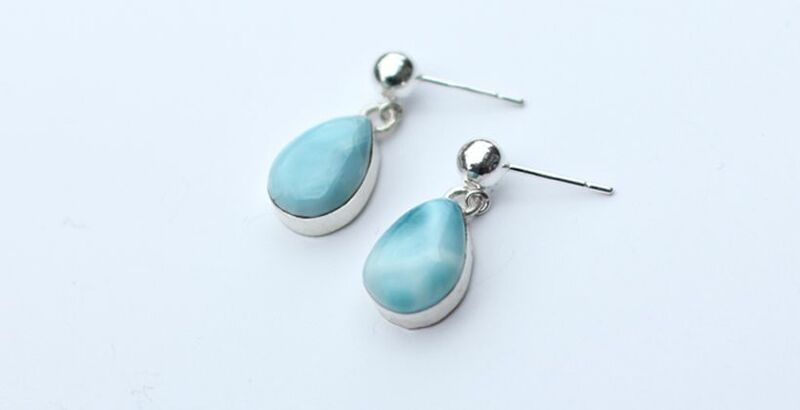 Esmeralda’s Natural Dominican Larimar Jewelry Collection is set in sterling silver and designs range from tear drops and round circles in stud and drop earrings and pendant necklaces. All set in hand poured sterling silver findings and necklace chains. A great complement and alternative to the popular turquoise which leans more towards the green-blue spectrum as Larimar runs closer to the sky blues and white. Larimar, a rare blue volcanic Pectolite, is found only in the Dominican Republic in the Caribbean. Its transformation in lava cavities and copper substitute for calcium produces its beautiful shades of soft blues and cloudy whites. Other tones can include green, red and brown inclusions from other minerals or oxidation. The stronger the blue color and contrast, the higher and rarer the quality. Its unique color palette is often compared to represent the Caribbean sea and sky. In alternative healing, Larimar is known for energy properties of tranquility, stress relief and a throat chakra that aids in clear confident communication. It is a water element stone, but its fiery volcanic origins make it a unique stone that balances these opposing energies with calm and soothing. Esmeralda can make no medical claims, but sharing for those who follow crystal arts and energy practices. To see more of the new Natural Dominican Collection shop online @ www.EsmeraldaStore.com or Esmeralda store @ 54 Church, Street, Harvard Square, Cambridge, MA.